Celebrity & dogs icon post! Cute idea! *sigh* As a proud and long-time pet fish owner, how come there aren't ever any pictures of celebrities with their fishes? Hehe. It was odd to see Picasso in that KK and Nicole Richie batch. How come there aren't ever any pictures of celebrities with their fishes? Guess they're not as portable! And hee, I had no idea where to stick Picasso as I didn't have any other artists ... he'd make more sense with Bowie, yes? I think that pic of George is from about 10 years ago, from the cover of Movieline. And yeah, Clooney + Dog = Win! Ahh, the eternal dilemma of not having enough icon space! Aw so cute! I bet that's the first time Nicole Ritchie was mentioned in the same breath as Picasso. Hee, I knew everyone would comment on the juxtaposition of Nicole & Picasso! For some odd reason the Picasso and pooch icon is my total fave. 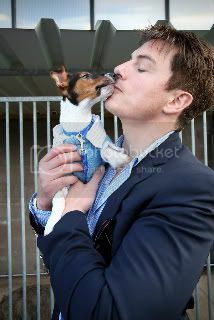 And I totally looked for Josh Hartnett & dog pix for you but couldn't find any! Isn't that second icon under "actors" David Tennant instead of John Barrowman? I got it from a Barrowman post on ONTD! And of course Bogart wouldn't have a lap dog! ETA: Sorry! I didn't realize that image was so huge when I uploaded it! I've since resized. PUPPIES! Puppies and Paul Newman. Yeah, I need one, but which one? I've been thinking about watching Butch Cassidy and Sundance Kid again, since Sawyer's line, and this was such a delicious reminder of what I could enjoy! Oooh yeah, vintage Paul Newman is always a good thing! what a great idea! and so many are just too lovely. I adore the one of Jorge and his little dog, so cute! Thanks! That one's so cute, isn't it? Thanks! Who doesn't love a cute pooch? They're so fluffy! I love them all. And ugh, the one of George Clooney and the Pug puppy is too precious for words! You have to love a guy who loves his dog that much! The Clooney is adorable indeed. See the ovary-melting comment above. EDIT: Because "over-melting" is not the same as "ovary-melting!" i adore this theme & post! Thanks! :) And aww, puppies! Such a cute icon.